Hello sweet friends! I know you are busy, and well, tis the season!! I have been very busy too working in my studio to fill the shelves of my etsy shoppe. I have a few items to share, but before I do, I want to invite you to visit over at Jan's Rose Haven to visit the Stroll of Shoppe's featuring many artists and their creative designs. Click here to visit Rose Haven! And for more fun, Jan has put together a giveaway from all the artists included yours truly. Visit to view the many wonderful gifts selected by the designers and read how you can comment to win. Good Luck! New items have come to my etsy shoppe, many with Sale prices, and discounted shipping. Here are a few of my new treasures. I also was so excited to win a gorgeous Marie De Fete Globe ornament created from the talented Gabriela Delworth. Click HERE to visit her lovely blog. These are a couple pics of the ornament I won. It is just gorgeous. Be sure and visit Gabriela's blog. You will enjoy your visit. Isn't this ornament lovely? See you next time with more Christmas home decorating. I'll be sharing my shabby rose room with pink tree and Christmas Villages. Did you do the cupcakes for Shirl, honey? I've been trying to find some. All your items are lovely, chick...just lovely. All your new items are just GORGEOUS!!! Thanks for posting about the STROLL and the GIVE-AWAY. Please...do stop by and just comment to win!! There are almost 20 prizes that will be awarded to lucky winners on Saturday!!! Good luck!!! I adore all your beautiful creations. Congratulations on winning the giveaway, the glass ornament is wonderful. Hi there Celestina Marie...you sure have been busy painting your little heart out and they are all just gorgeous. Can't honestly say there has been a time when I visited that you haven't had something beautiful to share with us all. 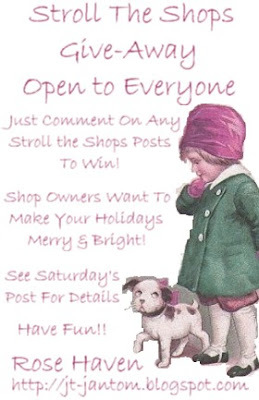 I will pop over and see what's what at Rose Haven and perhaps you might drop in on me to see what I have on offer for my favourite bloggers too. As always your painting is a feast for the eyes!! I just love to visit with you especially at Christmas!! Celeste, everything looks so pretty. Who would know that 2 of your creations are lightbulbs! What gorgeous new things you have created!!! Love them all...those little houses are precious and the snowman with the cap is too too cute!!! If I only had a pink room here!!! Guess I needed to have a daughter...but I still love the color and maybe one day. I will go check your etsy right now and that shop you mentioned too. Lucky you to win that Marie ornament! G'morn Celeste ~ Playing catch up with all your lovely creations! It is like being a kid in a candy store ... I so enjoy you & your creations, sweet lady! It is such a pleasure to meet you. Your work is absolutely fabulous. I love the little snowlady. She is just precious. I also love the Santas that you painted. You do such beautiful detail on your ornaments. I had to come over and meet you after seeing the Stroll the Shops Giveaway. Your work is devine. I have signed up to follow your blog. I can't wait to see what you share next. Please stop by and say hi. I would be so honored if you signed up to follow my blog as well. A pink Christmas! :-) Before blogs, the only colors I see during Christmas, aside from red and green, other solid colors. And then here comes the pink . . . pastel pink! :-)Doesn't it makes things much sweeter? Good thing too you don't get the urge to eat your creations. They are sweet treats Celeste. Uh huh, I'm sure someone else has already told you that. That sweet face ornament ball is a darling with his knitted hat. And Gabriela's globe ornament is beautiful! I think it fits you right to have won it. Congratulations! Hello Celeste, Thank you so much for stopping by and leaving such a sweet comment. I love all your new pretties that you have painted. I just put up a white tree done all in pink so I'll have to take a look at your Etsy Shop. Your christmas tree looks beautiful, where did you find Thomas Kincade cottage ornaments? I love his art, and collect all his cottages from Tela Flora. 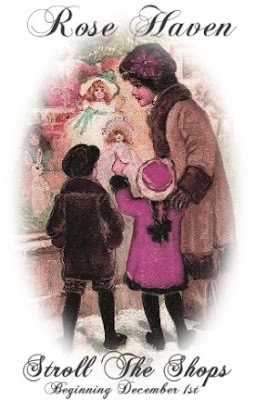 Loved your Santa collection, you have such pretty ones. It's always so nice to visit your beautiful home! I can always depend on you to keep in touch and write sweet comments. I think your offerings are just lovely and you certainly have been very very very busy. Yes we are blessed with work and good health and fine families and friends. What more can any one ask. God bless you and keep you safe, happy and prosperous. What lovely things you do create! You are a very talented lady my friend. Have A Peachy Keen Day. Loved your visit and sweet comments! You are just such a dear! And so creative! Love every item you have painted. I haven't done as much this year as in the past..more crafted this year. Enjoy seeing your wonderful ideas and lovely home! I keep coming back for more inspiration! Celeste, your new pieces are gorgeous. I think my favorite is that adorable ornament with the pink hat and happy face. Well done. I always smile when I see your beautiful creations. They inspire me. Can you believe it's already the 9th? Time is flying by. I need to start posting some decorations. Have a restful night, friend. Celeste, your creations are lovely as always. I love Gabriela and her Marie Antionette everything are beautiful, especially these ornaments. Congratulations, this ornament will compliment your ornaments on the tree, I am sure. Love your new things and your home is decorated sooooo beautifully.You have such grace and flare.I was looking at all your Santas.They are just beautiful.I was so ingrossed in making the Marie dolls that I forgot to make a Santa this year.I try and make a new one every yr.Christmas hugs and kisses are going your way. I want to wish you the merriest Christmas and May God Bless you.